Nov 6, 2006 • Dr. Samuel N. Goward is a professor of Geography at the University of Maryland College Park specializing in bioclimatology and remote sensing. He currently serves as a co-chair of the U.S. Geological Survey (USGS) National Land Satellite Remote Sensing Data Archive (NSLRSDA) advisory committee, and from 1997–2001 he was the Science Team Leader for the Landsat 7 satellite mission. As a graduate student, professor, NSLRSDA advisory co-chair, and Landsat 7 Science Team Leader, Goward has been a user, teacher, and proponent of Landsat data for over 33 years. Because of his tireless support of land remote sensing in general and Landsat in particular, he was awarded with the U.S. Geological Survey’s John Wesley Powell Award on Thursday, Nov. 9. The Powell award is the highest USGS award bestowed upon non-agency individuals. 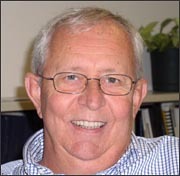 Sam Goward was born and raised in Lowell, Massachusetts, north of Boston, close to the New Hampshire border. He spent his childhood summers on Cape Cod where he developed a strong appreciation for nature’s beauty and for the Earth as our home. 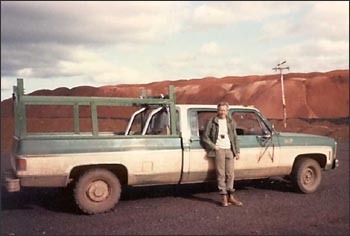 Goward’s strong affinity for the natural world led him to the field of Geography. He earned a B.A. and M.A. in Geography from Boston University, and after five years as a U.S. Army radar operator, he went on to earn a Ph.D. in Physical Geography from Indiana State University. It was shortly after beginning his Ph.D. program that the recently launched Landsat 1 first entered into Goward’s purview. Goward used data from both Landsat 1 (then called ERTS-1) and related experimental aircraft to develop his Ph.D. dissertation in climatology. Following his Ph.D. work, Goward worked in the Geography Department at Columbia University and the NASA Goddard Institute for Space Studies in New York. During that time he was involved with the Agriculture and Resources Inventory Surveys Through Aerospace (AgRISTARS) program. This program was responsible for some of the trail blazing research about using satellite imagery to monitor crop conditions and production. In December 1982, after three years of working on AgRISTARS, Goward seized upon an opportunity to develop a land remote sensing program within the Geography Department at the University of Maryland, in close association with the NASA Goddard Space Flight Center (GSFC)––the NASA center that has managed the building and launching of all of the Landsat satellites except Landsat 6. During his years at the University of Maryland, Goward witnessed a transformation of the field of Geography: “Landsat, remote sensing, and Geographic Information Systems have revitalized the discipline,” Goward tell us. And over the past decade, with the large strides in computer processing technology, the digital geospatial world of Landsat data is now accessible to everyone. “What started out as incredibly innovative and difficult––numerical data handling, processing, and analysis–– has now become commonly practiced within science, and now with Goggle Earth [and other similar geospatial tools], it is becoming a fundamental part everyone’s lives,” Goward describes. Goward in the field just outside of the iron ore mining town of Schefferville, Quebec (Northern Labrador-Ungava Peninsula in eastern Canada) measuring reflectance spectra of subarctic lichens. At the University of Maryland, Goward’s research has focused on using land remote sensing to improve our understanding of global land change dynamics caused by both natural variability and anthropogenic influences. “Our basic approach to systematic land monitoring is to examine change. Thus any process (such as seasonal phenology) that leads to land change must be understood and accounted for. Within this context, we are beginning to diagnose underlying human processes such as the politics of planning and the economics of renewable resource management,” Goward explains. The moderate-resolution and global coverage of Landsat make its data particularly useful for land dynamics monitoring of agriculture, forestry, hydrology, urbanization, and the like. The frequent coverage (every sixteen days) and long archive (34 years) of Landsat enables analysis of both inter-annual and seasonal land cover change. While Landsat’s data archive is the longest moderate-resolution land observation archive in existence, systematic global coverage was generally not a program priority until the launch of Landsat 7. The experimental nature of the first three Landsat satellites, and the failed commercialization of Landsats 4 and 5 led to suboptimal global data archiving. “Our efforts to evaluate the Landsat holdings in NSLRSDA have revealed how much over the last 30+ years, Landsat has been treated as an experiment (if an ill-defined experiment),” Goward reveals. “The variability of acquired coverage in space and time is really hard to understand from this 21st century perspective. However, from the experimental view, it is fully understandable and explainable. Today, we need to move toward a well-defined operational system that insures consistent cover from year to year,” he continues. Goward, in his role as the Landsat 7 Science Team leader, helped take the first steps towards consistent Landsat data coverage by devising and implementing the Long Term Acquisition Plan (LTAP). LTAP is an automated data acquisition algorithm that ensures nearly cloud-free Landsat imaging of every land surface area (between ~82º N and S) multiple times a year. Goward predicts that the methodology initiated with LTAP will become fully realized with follow-on Landsat missions. Recently, he and Dr. Darrel L. Williams were selected to serve on the USGS Landsat Science Team to advance the LTAP concept for the LDCM mission currently being pursued to replace Landsat 7. “As we move into the operational era, the Landsat concept will be redefined from a test of new technologies in space, to a more technically advanced observatory that insures consistent repetitive monitoring of the Earth to track the impact of environmental dynamics and human activities,” he predicts. And, with a global population of over six billion, Goward believes a robust global Landsat data archive is more important than ever. “At a time when human beings have come to dominate the state and dynamics of the Earth, we have developed the technology that permits us to monitor these dynamics and therefore, hopefully, manage our actions to the best benefit of this planet and ourselves,” he says. But are there enough people out there who know how to use Landsat technology? “The generation of scientists, engineers and decision makers just now coming into their own both understand this technology and expect it to be readily available to address societal needs,” Goward says. And, as his Nov. 9, 2006 Powell Award recognizes, Goward played a large part in the training of this geospatially-astute generation.